This is the sixth article in a ten-part retrospective of the Harry Potter soundtracks. You may wish to refer to the previous entries in the series for more information. Explain something to me, if you would: how does a soundtrack with some truly cool pieces of music that even to this day I find myself humming or whistling fail to end up even in the top half of the soundtracks for the Harry Potter films? At least, on my list? Because it’s not a complete work of art. After the excellence of Patrick Doyle’s Goblet of Fire soundtrack, I was really looking forward to what he had to give us on the next film. Instead, we got Nicholas Hooper, who, other than the two Harry Potter films he scored, hasn’t really done any scores I recognize (according to Wikipedia). Maybe that means something. In any case, Nicholas Hooper scored Harry Potter and the Order of the Phoenix, my least favorite of the eight Harry Potter soundtracks. Unlike Goblet or Chamber, Order really is nothing more than a collection of individual themes and cues without, to my mind, any real attempt at creating an organized theme throughout. Contrast that with the previous two soundtracks, which, as I noted, really felt like complete works of art with a beginning, middle, and end. I did catch a very slight attempt to tie everything together, but it was really done with moods instead of cues and musical phrases. I guess you could say the “Professor Umbridge” cue was used for that, but it’s not really replicated or played with enough for me to consider it as the film’s overarching theme or musical phrase — it doesn’t appear in enough tracks, especially the big ones. Not my favorite style. Also, the soundtrack itself isn’t presented in the order in which the tracks play in the film, which makes it difficult to mentally play the film as you listen. (Or, at least, as I listen.) Also, this soundtrack felt to me like a return to the original John Williams score, which really tried to lead you around by the nose and make you feel things, instead of making the music its own character in the film. “Fireworks” — More or less the Weasley theme, this is a rocking jig that is most enjoyable. “Professor Umbridge” — The string hits in the song actually seem to be saying “Professor Umbridge”. Clever. “Dumbledore’s Army” — A worthy successor to the “wizards doing wizard stuff” cue heard in the first two John Williams soundtracks. I wish it had been used more. “The Sirius Deception” — The ending really redeems what was, up until about 1:30, a pretty lackluster track. Again, there’s a series of cues that would have been better served as more of a unifying theme for the soundtrack. “Death of Sirius” — First of all, you can’t put the major climactic twist of the film into the song title. That’s just dumb. Now, for the actual music itself, I was pretty impressed — for a Boss Fight, it was pretty darn good, though again it would have benefited from being somehow tied into any of the other themes. 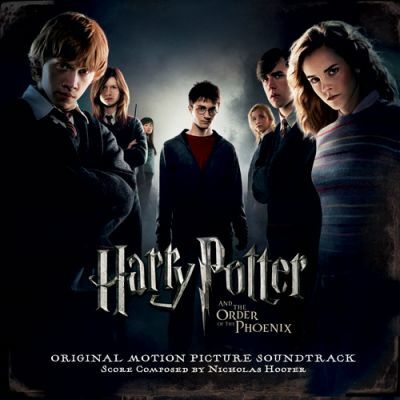 “Flight of the Order of the Phoenix” — Possibly the best cut on the album, this is the song that played as Harry and the Order flew through London. It’s only a minute and a half long, and I so very wish there was an extended version because it’s really, really good. Skip ahead to about 30 seconds in. “The Ministry of Magic” — We’ve heard about the Ministry for several films, but only now do we get to actually see it. Hooper gives it a grand theme with this track, although again I wish the actual good part was longer. As for “Hedwig’s Theme” — the very theme of Harry Potter himself — I was only able to catch it clearly in two tracks. The first is “Another Story”, which isn’t even the first song on the album (although it is the first cut in the film). It pops up for just a moment in “A Journey to Hogwarts”, but really, that’s it except for vague snippets here and there. A disappointment. “Dementors in the Underpass” — The chorus sounded way too electronic. It was distracting. “The Hall of Prophecies” — Poorly placed in the track list. Also, the first half is too quiet and moody, while the second is fairly standard “enemies chasing heroes” music, with quick-tempo strings and lots of large drums. “Possession” — More choruses, more strings, and an attempt to evoke the feeling of “Finale” in Chamber that never really panned out. “The Room of Requirement” — Despite a really catchy theme, I just did not appreciate the repetitiveness of this track. It was quite a long montage that it had to cover in the film — Malfoy, Filch, and the others trying to get in — and it was another one that leads you along by the nose instead of complementing what’s on the screen. “The Kiss” — Aural wallpaper that gets a little overblown toward the end. “A Journey to Hogwarts” — The beginning of this track was really, really promising, and I think that Hooper could have made what he did with “Hedwig’s Theme” into a true theme for the film. But I was left disappointed. The track is almost redeemed at the end, but there’s sort of a “French romantic comedy” feel to it that didn’t do it for me. “Loved Ones and Leaving” — Again, a track with a lot of promise and a lot of potential for overarching themes, but almost none of them were used earlier in the film. Plus, I wasn’t a huge fan of the flute used in the crescendo. It seemed unnecessary and a little trite. Overall, I think Nicholas Hooper is a talented composer, and I found several tracks I was able to enjoy as singular pieces of music. However, I thought the soundtrack of Harry Potter and the Order of the Phoenix was a step backward in terms of soundtrack-as-character and soundtrack-as-complete-work-of-art. There was a lot of promise shown, and it was shown in may of the tracks, but I just didn’t feel like Hooper delivered on it. That’s why I say it’s my least-favorite of the Potter soundtracks, and why I was disappointed again that Hooper was chosen to compose the music for the sixth film. But, as you’ll soon see, my worries… well, they were pretty short-lived.